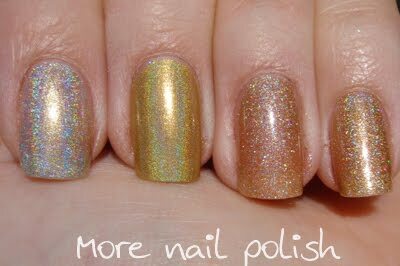 Here I have done a comparison swatch of some of my holographic polishes. 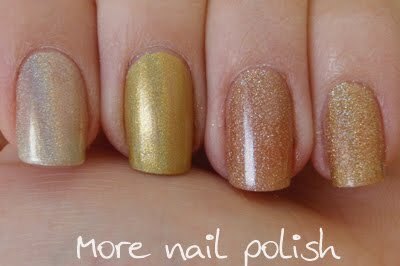 I class these ones as the 'golds', compared to the 'browns' and 'beiges' of future comparison swatches. Here are the same indoors. Art Form Gold is really more a platinum colour and GR8 is the only real yellow gold. 'It's my turn' is slightly more yellow than DS Original which can just be seen in these pics. I can't pick a favourite amogst these, but I could probably say that my least favourite is GR8, only because I prefer a less yellow gold polish. I can't believe that it's almost the end of June and I have only posted once this month. It's just not good enough is it. I have heaps of colours and polishes swatched, so I think I might do a few posts that are light on with text and just pictures, which is what we are all really here for anyway, the pictures, not to listen to me babble on. This here was another foil creation. 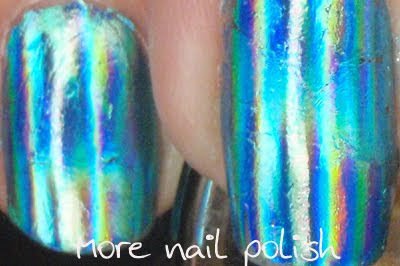 This was a very shiney metallic blue foil, which when applied to the nail gets this incredible stipe across it as it follows the curve of the nail. I really love foils, and have to say that application does get better with practice. The weather has been so cold and overcast here in Canberra recently that I just haven't got any swatching done. And I have been wearing the same manicure since Sunday night!! OMG can you believe it. I must say my current mani is pretty cool (I have taken some indoor pics which I will show in another post) The mani I'm wearing is Zoya Mimi with Nfu Oh Flakey layered over the top - the wear has been increadible. Also, a couple of weeks back I received an amazing package in the mail from the Heat Group in Australia, who are responsbile for Max Factor, Cover Girl, Bourjois, Ulta3 and Elite. The package contained 40+ regular ulta3 polishes, 11 speed dry Ulta3s and a couple each of Max Factor, Cover Girl and Bourjois polishes. I haven't had time to swatch the new polishes yet, which is just killing me. There is one polish with this amazing wide brush that you only need to do one swipe and I can't wait to try it. Some are new brands for me too, which I always love trying. Most of the Ulta3 polishes are ones that I already own, so I have been trying to work out the best way to give them away to my readers. Unfortunately the cost of internatioanl postage for my last giveaway was an absolute killer, around $60, so while I would love to give some to everyone, I just can't afford the postage. 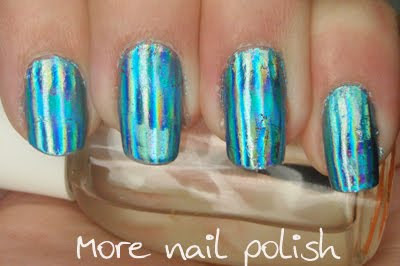 Can you belive that it cost $10 to post a single polish to the USA!! 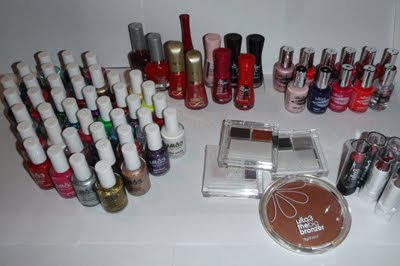 If you have any good ideas for me to giveaway these 40 polishes (some are dupes), then let me know.